Heathrow Airport says it is to open a temporary terminal for athletes departing after the London Olympics closing ceremony. Heathrow predicted 13 August would be its busiest day ever, with 138,000 passengers – 45% more than usual. It said the Games Terminal would operate on 13-15 August. It is expected to divert up to 10,100 people and 37,900 bags from other terminals. Airport owner BAA said it was spending more than £20m on the Games. In addition to the temporary terminal, the money will be spent on building lifts to handle Paralympians’ wheelchairs, providing extra media facilities, and recruiting and training volunteers to meet and greet passengers arriving for the Games. Heathrow’s Olympic programme would not use any public funds, BAA said. 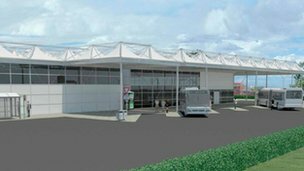 Construction of the terminal will begin in February in an area currently used for staff car parking on the south side of the airport. No flights will leave from there, with athletes bussed to departure lounges. The airport’s head of Olympic and Paralympic planning, Nick Cole, said the Games were a “unique operational task and a massive challenge”. “Every part of the airport is working together to ensure we can give the athletes a warm welcome and ensure all passengers enjoy the atmosphere,” he said. Heathrow says 27 June to 1 October will be its critical period, with 80% of Games visitors expected to pass through the airport. On its busiest expected days – 26 July and 13 August – it predicted passenger levels would increase from an estimated 95,000 on a usual day to 138,000. It said the UK Border Agency (UKBA) would be able to use dedicated immigration lanes for accredited Games Family members, athletes, coaches, officials, accredited media and other individuals arriving. The UKBA had also set up a special customs system to deal with the hundreds of firearms expected to be brought in by Games athletes, it said. Heathrow is expecting a 35% increase in baggage on 26 July and 13 August, with around 15% of the 200,000 items expected on those days likely to be oversized luggage. The airport said it would have “insufficient capacity on carousels and floors in the baggage reclaim hall for waiting passengers”. Measures to combat this would include standing bags up on carousels and removing some luggage from carousels to another area before customs control, it said. The flow of passengers into the baggage claim area could also be controlled. The airport said it would offer check-in at the Olympic and Paralympic Village for athletes leaving the Games, with their bags collected a day ahead of departure. There would also be special areas for coaches carrying Olympic athletes outside Heathrow’s terminals. Heathrow said it did not believe the Games presented a higher security risk but it was recruiting 250 security staff “in part to give us more resilience during this summer”. Heathrow will test its procedures and the airport has 50 full-time staff working on its Olympic programme. It said that number was likely to “increase significantly” as the Games approached. How many extra visitors to London will there actually be during the Olympics? The Olympics are having a devastating effect on bookings for inbound tour operators, according to new research. The 38 members of the European Tour Operators Association reported an average 95% downturn in bookings during London 2012. Some reported plummeting sales of nearly 100% for August. These members are responsible for bringing in two million tourists a year and represent more than £2 billion in export revenue to the UK economy. In an earlier report, ETOA members predicted a 30% fall in business during the event. “The expectations of visitor numbers currently circulating within the hotel industry are hugely inflated,” said ETOA executive director Tom Jenkins. Posted: Thursday, January 19th, 2012. Filed in News about Airports, Recent News.